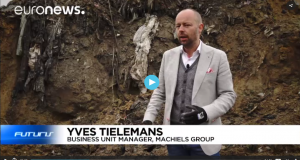 Euronews-Futuris has just released a new video on Enhanced Landfill Mining, featuring researchers from Montanuniversität Leoben and KU Leuven. The video offers new footage of the Closing the Circle ELFM case in Houthalen. 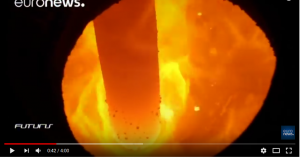 Euronews-Futuris has just released a new documentary video on the reprocessing of red mud (bauxite residue), featuring experts from RWTH Aachen and KU Leuven in the context of the EU Horizon 2020 MSCA-ETN REDMUD project. Researchers are invited to (pre)register for the ETN/EIT Summer School “To mine or not to mine: A multi-criteria assessment of the landfill mining of municipal and industrial solid waste deposits” (September 10-12, 2018, Leuven). 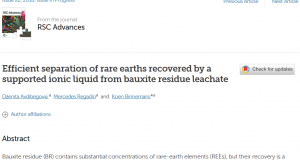 Could “red mud” (bauxite residue) be the answer to some of Europe’s critical-metal supply concerns? 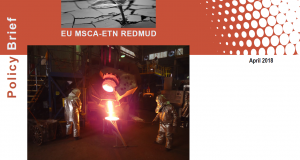 That’s the central question addressed in the April 2016 EU MSCA-ETN REDMUD Policy Brief, authored by Dr. T. Baleomenos (Greece). 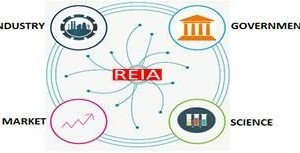 On March 29, 2018, the kick-off event for GloREIA took place in Brussels. GloREIA is to become a new, global association for the rare earth industry. 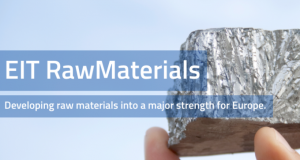 To kickstart this association EIT RawMaterials provides financial support. 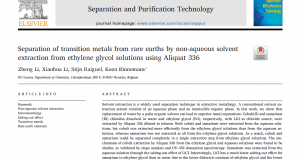 In the framework of the ERC SOLCRIMET project KU Leuven researchers have found that replacement of water by ethylene glycol provides enhanced selectivity in the solvent extraction of transitions metals from rare earth elements. This new RSC Advances paper demonstrates the effectiveness of a novel supported ionic liquid phase (SILP) for the uptake of REEs (Sc, Y, Nd, Dy) in the presence of base elements (Ca, Al, Fe) from bauxite residue (BR) leachates. 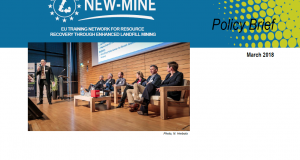 The ETN NEW-MINE project has just published a new Policy Brief on the future of Enhanced Landfill Mining in Europe and beyond. The Policy Brief draws Six Lessons Learned from the recent ELFM IV Symposium (February 5-6, 2018). 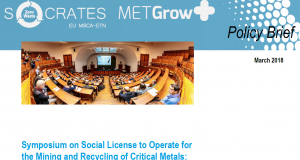 ETN SOCRATES and METGROW+ have published a joint Policy Brief on the Social License to Operate for the Mining and Recycling of Critical Metals, which is meant to stimulate this crucial debate for the EU mining/metallurgy sector.